Following is a Q&A with National Council on U.S.-Arab Relations Founding President & CEO Dr. John Duke Anthony regarding Russia’s interests and involvement in Syria. Q: What characterizes Russia’s relationship with the Bashar al-Assad regime? 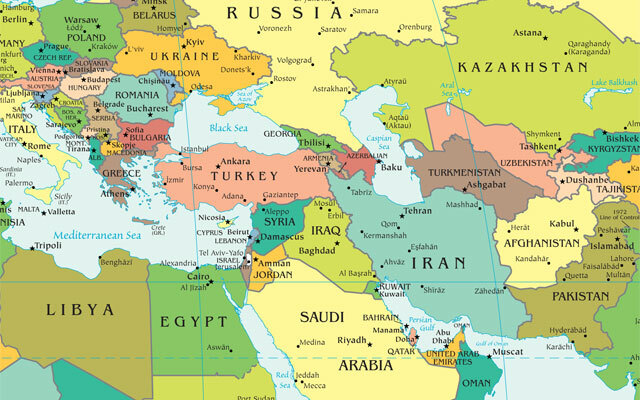 A: Out of the 22 Arab countries, 28 Middle Eastern countries, and 57 Islamic nations, Russia’s allies are few. 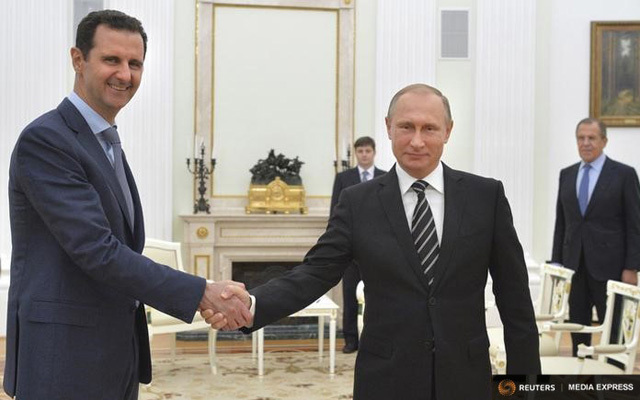 Moscow’s relations with Damascus are closer than its relations with the capitals of other Arab countries. Indeed, they are closer than its relations with other Middle Eastern countries as a whole. As a result, Russia’s military actions in Syria aim to protect Assad and the country’s leadership and to keep Syria strong. Other nations may not approve of this stance, but it must be acknowledged that Moscow has interests in Syria that it wishes to protect as well as the goal of further strengthening and expanding an allied relationship. What is also important and largely missing from or downplayed by the mainstream media is that Moscow, in standing with Damascus, provides the Syrian leadership with a rebuttal to the other UN Security Council Permanent Members (China, France, the United Kingdom, and the United States) who state or imply that Syria lacks international support. Russian President Vladimir Putin shakes hands with Syrian President Bashar al-Assad during a meeting at the Kremlin in Moscow, Russia, October 20, 2015. ©REUTERS/Alexei Druzhinin/RIA Novosti/Kremlin. Q: What are Russia’s particular interests in Syria and are they of recent or older vintage? A: They are numerous and date back to the respective reigns of Catherine and Peter the Great. Both sought ports in southern climes that could facilitate and sustain Russian east-west and west-east maritime ventures involving trade, rest, and resupply. During the Cold War, in addition to these commercial and economic objectives, interests of a military nature – aeronautical and naval, mainly – manifested themselves in the construction of port facilities to accommodate Russian ships traversing the waters southward from Turkey and Greece in the eastern Mediterranean. As a matter of course, Russia used these port facilities also to build the country’s air defense system and weaponry as well as to ensure provisions for armaments, munitions, training, and maintenance for the system and the country’s defense establishment as a whole. Q: What should be kept in mind when attempting to understand the U.S. mainstream media on the Russian intervention in Syria? A: Israel and its friends, together with the large and growing number of Syrian-Americans, Syrian-Europeans, and the leaders of various Arab governments who oppose Assad, along with U.S. human rights groups and others, are engaged in a continuous public relations campaign designed to try to weaken and discredit Russian involvement in Syria. Despite this, it is important to remember that Russia’s position is defensible. That is, it is plausible if viewed from the perspective of the country’s legitimate requirements, worries, and aspirations. Russia’s position becomes the more understandable still if it is coupled with Moscow’s need to counter terrorism. Certainly, it becomes more comprehensible if viewed through the lens of what Russia has had to contend with in dealing with violent extremists in Chechnya. In this regard, one need only consider that Greater Moscow’s population is between 15 and 17 million people, with approximately 12 million living in the city proper. It takes very little to imagine how vulnerable highly concentrated Russian populations would be and are were terrorist threats to urban centers left unchecked. Herein lies one issue among others in which American and Russian needs, concerns, and interests converge. The chances are good to better that Russia will be able to protect its assets in Syria – which are not necessarily synonymous with maintaining Assad in power indefinitely – and, as a result, Russia stands a reasonably good chance of prevailing over its negative media treatment. Q: How would you describe Russian-Turkish relations, particularly in the aftermath of Turkey shooting down a Russian plane on its border with Syria yesterday? A: The relations are very tense, particularly due to the Russian air campaign in support of the Syrian government. Such support is in opposition to the Turkish position. The latter is set on toppling the Assad regime and providing supplies to the Free Syrian Army and the “moderate” political opposition. Whereas Moscow views Syria as an important friend, ally, and strategic partner, Ankara sees the matter differently. It continues to view the Assad regime and the Kurdish national movement in Syria and Turkey as a major threat. Because Turkey is at once a neighbor of Russia and a member of NATO, its foreign relations, policies, positions, and actions, in comparison with Arab and other Middle Eastern as well as Islamic nations, are at once enhanced and limited, depending on the issue. Even so, Turkey may seek to reexamine its economic relationship and energy cooperation pacts with Russia, as NATO countries and the European Economic Union have done. This would be but one way to express its frustrations with Russia. In response, Russia would hardly be bereft of the means to retaliate. Indeed, Russia has more outlets for its energy and other exports than Turkey as yet has for its exports. Turkey could also shoot down another Russian plane. That would be another way to try and force Moscow to reevaluate the efficacy of its policies, positions, and actions toward Damascus. Doing so, however, would risk upping the ante. Q: How do Russia and Iran compare in their support of the Assad regime? A: Both want to protect what each perceives as a very important strategic and geopolitical asset. Each has economic and financial – for example, energy and monetary – resources it can extend to Syria to help shore up the regime in Damascus. Each also sees Syria as a testing ground to ascertain how it can outdo the United States in the ability to stand by an important ally. From being on the ground inside Syria, both gain valuable intelligence about forces opposed and/or supportive not only to their respective policies and actions but also to the policies and actions of outside powers such as the United States. A difference between the two is that Iran is a fellow Muslim country whereas Russia is not. In addition, Russia’s military support has to do with Syria’s conventional armed forces in terms of aircraft, tanks, and naval vessels. In contrast, Iran’s military support is in the form of asymmetrical guerrilla forces. In this regard, as was on display in Iraq, Iran offers expertise in the form of IEDs – Improvised Explosive Devices. It is also adept at forming and sustaining so-called irregular militias. And it has an uncanny ability to destabilize adversaries without necessarily confronting them head-on militarily. 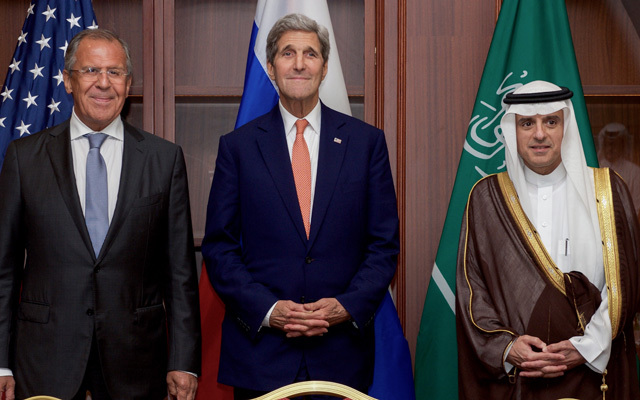 U.S. Secretary of State John Kerry stands with Russian Foreign Minister Sergey Lavrov and Saudi Arabia Foreign Minister Adel bin Ahmed Al-Jubeir before a trilateral meeting focused on Syria and other issues following a meeting of the Gulf Cooperation Council in Doha, Qatar, on August 3, 2015. Photo: U.S. Department of State. Q: What are the views on Russian involvement in Syria of other major players in the conflict, such as Saudi Arabia and its fellow GCC countries? A: Saudi Arabia and its fellow GCC member states are not all of the same views or opinions. This said, consider that Iran is engaged in a proxy conflict with Saudi Arabia and, by extension, the nine Arab countries aligned with it in regard to restoring the legitimate government in Yemen. The struggle is not only for dominance – or the weakening of the Saudi Arabian position – in the Gulf and Yemen. It is also for dominance in the eastern Mediterranean. In this light, Riyadh perceives that it would be but elementary strategic wisdom to do whatever is necessary to prevent Tehran and its allies from surpassing, let alone defeating, Saudi Arabia as the leader of the League of Arab States’ member countries. For several years now, the view of many in Riyadh has been that weakening, if not breaking, Tehran’s ties to and support for Damascus is at once logical and prudent. By extension, anything Riyadh might be able to induce Moscow, at minimum, not to strengthen and expand its support for the Assad regime would seem to be in order. So, too, with regard to Riyadh’s trying to persuade Russia to do whatever it can to stop the slaughter in Syria. Viewed from this perspective, one has a clearer picture of the visits to Moscow by Saudi Arabia’s foreign minister. What also becomes clearer is the rationale and impetus for Russian President Vladimir Putin’s subsequent visit to Iran in the past 48 hours to meet with Supreme Leader Ayatollah Khamenei. In both instances, the purpose, in my view, was to emphasize the need for a political settlement, not a military defeat or victory by either side or by any of the players. This entry was posted in John Duke Anthony, Russia, Syria.